A suspect was killed by Santa Ana police after a short foot pursuit Tuesday afternoon, according to CBS News. 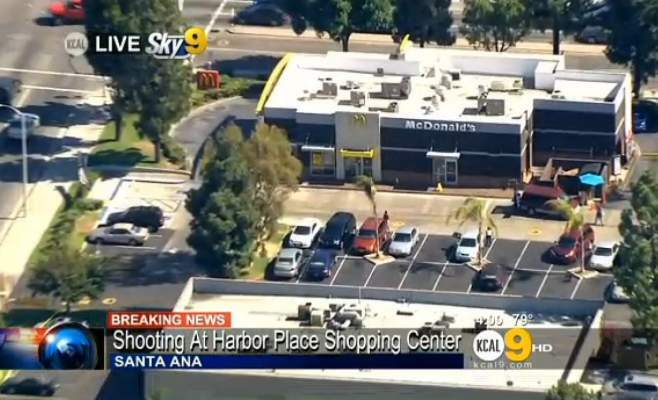 Authorities responded to a call of a disturbance in a parking lot near McDonald’s at Harbor Boulevard and McFadden Avenue, at the Harbor Place Shopping Center, at about 3 p.m. An officer approached the suspect, which led to a short foot pursuit, according to KABC News. The man then fled on foot and was shot in the 600 block of South Harbor Boulevard, where he died, Bertagna said, according to NBC News. The Orange County District Attorney’s Office will investigate the shooting, as it is protocol in all officer-involved shootings, officials said, according to the O.C. Register. Click here to see a video shot at the site of the shooting by CBS News. « Santa Ana and Anaheim residents among those arrested for rioting in H.B. That shopping center is horrible. If you go to McDonalds there are always all kind of crazy-looking people by the front door and by the drive-thru….Thank you AB109! That is no reason to take some ones lives just because he looks that away that is not correct by our standers. Was it to much force? Well he can’t speak he is dead. Only the policeman knows. i feel that to many killing form policeman, some over reacting even in attitude. That some of them you can’t even approach them and i will say that it usually the younger policeman being hard over stupid crap. God bless those men in blue doing the best they can for the people and being just in their action. I pray the truth comes out and if the policeman was in danger so be it. and if was wrong to take that mans life. then he shall have to pay his dues. Those idiots out that will say any thing due to their narrow minds. I’ll pray for you that the Almighty have mercy on your souls. Was a policewomen who shoot him she had a tazergun that could reach 15feet like really why a gun????? And pluss he was having a baby at that time with his gf or wife I don’t know… but that shootin was dumb he wasn’t in even runnin he just got shoot for pulling out an ipod like really!! !